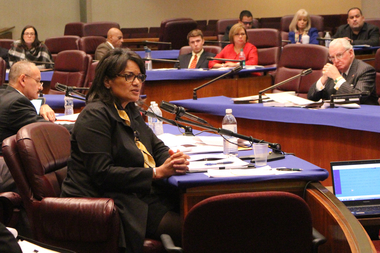 New IPRA head Sharon Fairley faced more than three hours of intense questioning by aldermen. CITY HALL — The new head of the Independent Police Review Authority and the president of the Police union faced intense questioning Tuesday before a joint City Council committee dealing with fallout from the Laquan McDonald case. 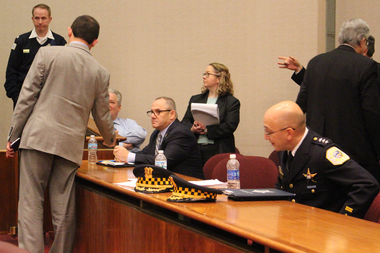 The joint meeting of the Public Safety Committee and the Human Relations Committee took on the issue of Police Department reform in the wake of officer Jason Van Dyke shooting the 17-year-old McDonald 16 times in October 2014. "I'm disturbed," Ald. Emma Mitts (37th) told Fraternal Order of Police President Dean Angelo Sr. late in the daylong hearing. Admitting most officers are admirable, she quickly added, "Lord help those bad son of a ... you've got some bad officers out there, and we've got to get rid of them. Ald. George Cardenas, head of the Latino Caucus, and Ald. Ariel Reboyras, chairman of the Public Safety Committee, discuss what they expect out of Tuesday's hearing along with Ald. Gilbert Villegas. "We need to get rid of those suckers, those bad suckers," Mitts added. She later said much the same to interim Supt. John Escalante, adding, "I'm tired of people being shot down like dogs." Ald. Gilbert Villegas (36th) questioned the "optics" of Angelo escorting Van Dyke after he bailed out on murder charges, saying it suggested "the FOP supports and condones this type of activity" and that it did a "disservice" to good officers. "As the president of FOP, I had to be there when no one else would," Angelo said. Earlier, he said the union was "watching the backs of the people who watch your backs." Sharon Fairley, the newly appointed head of the Independent Police Review Authority, began the day facing harsh grilling from aldermen for almost four hours — in only her first week on the job. She agreed with Ald. Joe Moore (49th) that charges made against IPRA in the Glenn Evans trial were "disturbing." "This particular case is on the top of my list," she added later when pressed on the Evans trial by Ald. Edward Burke (14th). "I will be talking to everybody involved in that investigation." Ald. John Arena (45th) wondered aloud if it would have taken over a year to file charges in the case of a police dashcam video showing an African-American man shooting a white officer. "Black folks have been treated unjustly," added Mitts. "And I want to make sure you get to that part and stop it." Fairley said IPRA was falling back on a federal investigation into Van Dyke's shooting of McDonald. "It's not unusual for an administrative agency to stand down," Fairley added. "There has been no finding by IPRA on that matter," Fairley said. "The trust has been broken," she added, saying that she did not think the public had confidence in the agency to make a determination in that case. Some aldermen were incredulous. "I don't hesitate to call it a murder," said Ald. Danny Solis (25th). "The system is not working." "Somebody dropped the ball," said Ald. Susan Sadlowski Garza (10th) when she discovered Van Dyke was not questioned by investigators about past incidents, such as his presence at the 2005 police shooting of Emmanuel Lopez. "We have to take into consideration people's past records." "Maybe that system isn't robust enough," Fairley said. "Reform is necessary." She said the union contract had limits on the use of past history in an investigation. Yet she added reform would be a methodical process only just underway, and that she would be looking into policy and procedures on, for instance, whether IPRA investigations should move ahead of criminal cases in some instances, such as that of Evans. Fairley said she expected to be back before the Council at some point to discuss necessary reforms. Ald. Christopher Taliaferro (29th), a former Chicago Police Department Internal Affairs officer, said there was no excuse to halt an investigation in the face of a potential criminal case, especially when it resulted in "untimely" delays that undermined public trust. "IPRA has a deep institutional bias favoring police," charged Ald. Leslie Hairston (5th). Fairley said Mayor Rahm Emanuel had told her to "fix it" when he appointed her head of IPRA, but Ald. Raymond Lopez (15th) said, "I think your instructions should be to scrap it," suggesting Inspector General Joe Ferguson could take up the task of the Police Review Authority. Yet Ald. Patrick O'Connor (40th) defended Fairley and IPRA, pointing out the agency can't compel an officer to offer testimony in a case that might result in criminal charges. "You're protecting the integrity of a criminal investigation," O'Connor insisted. Many aldermen had little sympathy for Fairley's short tenure on the job. "You don't seem to have the answers to a lot of things," said Ald. Milly Santiago (31st). "It seems as if it's Scott Ando who needs to be here today," Arena said, referring to Fairley's predecessor. "I think there has been a total loss of confidence in your agency," Burke told Fairley, warning her to be better prepared for her impending confirmation hearing before the City Council. Angelo generally had an easier time of it, but did not come away unscathed. "The FOP has taken some sort of a beating over the last few weeks, as have officers on the street," Angelo said, adding that Department morale was at an all-time low in his experience. He decried the "rhetoric" coming out of the Council. Arena lashed back that the Department had cost the city $500 million in settlements since 2010. "I will not accept that we are the reason your members are disgruntled," Arena said, calling Angelo's statement "out of line." Police union President Dean Angelo Sr. (c.) and Acting Police Supt. John Escalante (r.) wait to testify in Tuesday's committee hearing. Arena charged that the union was being overzealous in defending officers immediately after police shootings. Angelo said the union had addressed that, in that the Department will now comment on shootings on the scene, and not a union spokesman. "I am very upset with you," Ald. Pat Dowell (3rd) told Angelo, adding that, while he said his "kids" on the force were being kicked when they were down, "our kids are getting killed while they're down." Dowell called for changes in the union contract, saying, "The status quo is unacceptable." Pressed on the subject of criticism by Ald. Joe Moreno (1st), Angelo said he took particular offense at talk of the "code of silence" in the Police Department. "They are humans," he said of officers. "They have shortcomings. They have compassion." Interim Supt. Escalante pledged to work on reform while in the office and pointed to leadership changes and a recruitment campaign meant to add to Department diversity. He made clear the Department "will not tolerate officers who lie or who cover up the misdeeds of others," saying they would face firing. Protesters briefly disrupted the hearing after Escalante began his testimony late in the day. They chanted, "16 shots and a cover-up," until they were ushered out by police. Lori Lightfoot, president of the Police Board and head of the new Task Force on Police Accountability, said it was all about restoring trust at this point, adding, "Police can't do their job effectively if they don't have the trust of the community." 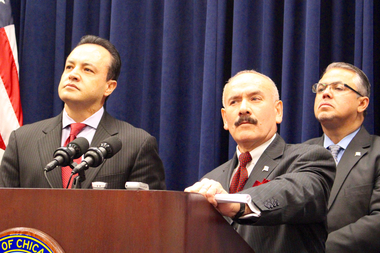 "Across the City of Chicago, there is a lack of trust in the Police," agreed Ald. Harry Osterman (48th). "That has to be rebuilt." Taliaferro, however, questioned whether Lightfoot could play a role in that process as someone already part of the entrenched system Chicagoans have lost trust in. Lightfoot bristled, asking Taliaferro to look at her "body of work" in law enforcement and challenging "anyone who would question my integrity." Cook County State's Attorney Anita Alvarez was also invited to testify, but did not attend. Other topics on the agenda were resolutions on Police Department practices and others calling for hearings on the McDonald case and Emanuel's newly appointed Task Force on Police Accountability. The meeting was run by Ald. Ariel Reboyras (30th), chairman of the Public Safety Committee, and Moreno, head of the Committee on Human Relations. Last week, after Emanuel's speech on the McDonald case to the Council, Reboyras called for action, saying, "Resignations are not enough. Protest is not enough. We need actual policy changes." Ald. George Cardenas (12th), head of the Latino Caucus, emphasized that it was a "color blind" issue, involving Hispanics as well as African-Americans, and cited the case of 23-year-old Lopez, shot 16 times by officers in a 2005 incident. Cardenas said the hearing would focus on "the need for reform," especially in the area of "police misconduct," adding, "This is the first necessary step for the city not only to heal, but to fix the broken system that affects all of us." "How are things gonna change?" Garza asked Angelo at one point. "How are things gonna change in our city?" "That's the million-dollar question," Angelo replied.